I like the look of all the leggings or skinny jeans lately (yeah, I'm probably a couple years too late again, but whatever). But what I really need is long shirts or tunics to wear with something like that before I take the plunge on more than the two pair of skinny pants I've got so far. Isn't this cute? 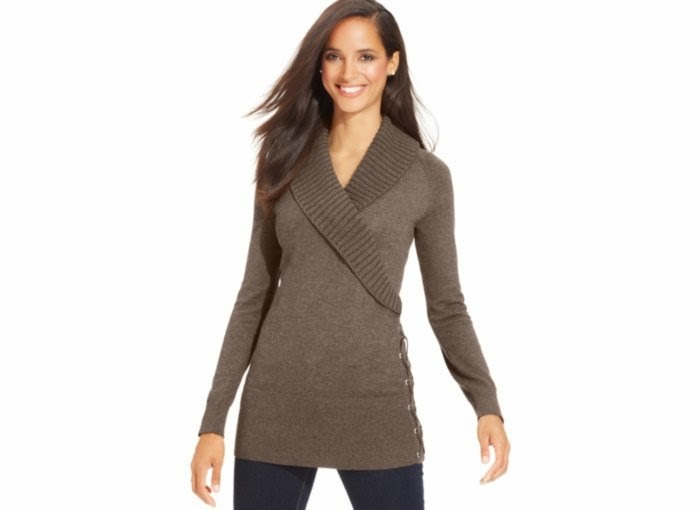 This shawl-collar lace up side tunic is available from Macy's on the Black Friday sale for just $19.99! I believe I'd be a size medium, and I like any of the colors besides the red. Want to really make my holiday? A pair of matching/complementary leggings or skinny pants would be awesome and a new outfit would be complete. I bought myself one new sweater going into this fall, and wore it for Thanksgiving with our families. But it has already shrunk. It was never intended to be a tunic, but today I had to wear a long tank top underneath it so I didn't feel so exposed. And the sleeves don't reach my wrists anymore. Oh well. Hopefully I'll have better luck with this tunic, or something else similar and warm.